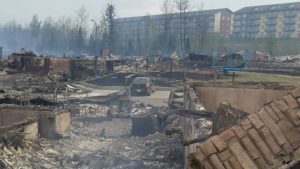 The Fort McMurray wildfires that continues to rage in Alberta are set to become the most costly natural disaster event in history for Canada, and as a result losses are expected to hit reinsurance layers and possibly ILS or alternative capital, according to analysts at Deutsche Bank. The wildfires have now been raging since Sunday in the Fort McMurray area and with the entire town evacuated thankfully there are still no reports of any deaths due to the fires. But damage continues and some of the early pictures coming from the town show the level of devastation caused. We’ve expected this to be the case, due to Canadian primary insurance companies typically conservative use of reinsurance cover, as noted in our previous articles on the fire. Retentions can be low in the country, resulting in an increased chance of the burden falling to reinsurers, something Deutsche Bank agrees with. Deutsche Bank analysts note that the loss so far seems to be largely restricted to retail and commercial properties, but notes that should any of the oil infrastructure come under threat the commercial losses could rise dramatically. As we’ve noted before though, there is a chance of some business interruption claims filtering through to add to the insured loss total, as so many of the oil facilities have been evacuated or had their pipelines shut down as a safety precaution. Deutsche Bank expects the Fort McMurray wildfires will be a reinsurance event, more than a primary insurance event. The reasoning behind this is that of the three largest primary insurers in the local area, Intact with roughly a 16% market share, Aviva with 8% and RSA at 7%, their direct exposure to this event is limited to around US$170m due to their reinsurance provisions taking losses above that level. The analysts from Deutsche Bank note that as this is small compared to the potential size of the insurance industry loss from the wildfires, they expect losses will quickly eat into reinsurance layers, and note that this could potentially also affect any exposed ILS and alternative capital protection. Of the global reinsurance firms, the analysts say that Munich Re would likely be most exposed with around 20% market share on a premiums written basis, with Swiss Re next at 17%, followed by Hannover Re and SCOR. However, the latter two reinsurers will likely be less affected due to their use of retrocessional protection, according to Deutsche Bank. With reinsurance layers looking almost certain to be hit and possibly even some retrocession, it is almost guaranteed that the insurance-linked securities (ILS) market will take some of the loss, even if minor. 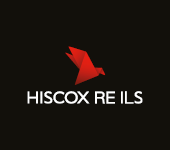 There is the potential for private ILS or collateralised reinsurance contracts underwritten by ILS fund managers to be exposed, any quota share arrangements with the exposed primary insurers could also face losses, reinsurance sidecar investors may also find their investments exposed and any retrocessional arrangements could as well. We would expect any portion of losses from the fires taken by ILS capital and investors to be minimal however, with it likely that traditional reinsurance players will take the brunt of any exposure. Deutsche Bank’s analysts note that with catastrophe losses still remaining relatively benign over recent years, even a loss like this should be well within budgets. Also reinsurers have a buffer that has been building thanks to the benign level of losses in recent quarters. Q2 does look set to be a jolt back to reality though, for catastrophe and weather losses and after the Japanese earthquakes, Texas floods and hail, the Fort McMurray wildfires will see reinsurers catastrophe loads higher by this stage of the year than seen for a while. Update 9th May: It’s worth noting that a local politician has said that on entering the city to view the damage it was apparent that around 20% of buildings were severely damaged or destroyed, while the remainder were largely unharmed. We’ll continue to update you as and when further information becomes available. Also read from yesterday: Fort McMurray wildfire could cost insurers up to C$9bn: BMO Capital Markets.